The Ginseng plant grows in rich woods throughout eastern and central North America, especially along the mountains from Quebec and Ontario, south to Georgia. It was used by the North American Indians. It is a smooth perennial herb, with a large, fleshy, very slow-growing root, 2 to 3 inches in length (occasionally twice this size) and from 1/2 to 1 inch in thickness. Its main portion is spindle-shaped and heavily annulated (ringed growth), with a roundish summit, often with a slight terminal, projecting point. At the lower end of this straight portion, there is a narrower continuation, turned obliquely outward in the opposite direction and a very small branch is occasionally borne in the fork between the two. Some small rootlets exist upon the lower portion. The color ranges from a pale yellow to a brownish color. It has a mucilaginous sweetness, approaching that of liquorice, accompanied with some degree of bitterness and a slight aromatic warmth, with little or no smell. The stem is simple and erect, about a foot high, bearing three leaves, each divided into five finely-toothed leaflets, and a single, terminal umbel, with a few small, yellowish flowers. The fruit is a cluster of bright red berries. To evaluate how "cold" or how "hot" in human body is a state of art. For instance, traditionally, the bitter melon was considered as a mild "Ying" or "cold" type of food. In Chinese medicine point of view, it will help fighting diseases caused by too much "Yang" or too "hot" in the body system. The water melon is considered as an extremely "cold" food. For people with serious illness resulting from "too hot" (such as stomach cancer), the water melon may cause adverse effect. Why? Think about putting hot water into iced cold glass that causes the glass to crack. The body will not be able to take it. The above is just a simple example of how Chinese medicine works and what the basic concept behind it was. It does not make sense to many scientists however; it does work in many cases. There are several types of ginseng available: Asian ginseng, also called panax ginseng, American ginseng, Siberian ginseng and Japanese ginseng. Panax ginseng, which is grown especially in Korea, China and Japan, is the most widely used. American ginseng grows commonly in wooded areas from Quebec to Minnesota and south to Georgia and Oklahoma. Siberian ginseng grows in forests of Russia, China, Korea, and Japan. Only Asian ginseng and American ginseng is known for their exceptional curative properties. These two species of ginseng look very similar and have also similar chemical compositions. These days, North American Ginseng is cultivated in British Colombia, Ontario, and Wisconsin, and is a valuable export. 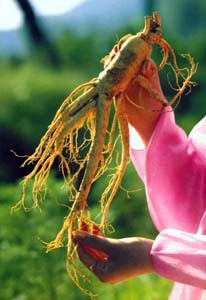 North American ginseng is often considered the most valuable and beneficial. For the past few years, The Chinese government and the Taiwanese government spend a great deal of resources trying to figure out "how it works" and "why it works". There will be many years before people are able to completely figure out what make Chinese medicine works. The Chinese do not know either. Not yet and not completely anyway, but they will find out. © 2005 ChinatownConnection.com, Houston Chinatown Web Portal. Ginseng. All Rights Reserved.